Since 2004 Chuenjit has been working with highly 'at-risk' young people (14-17 year olds) in the Youth Detention Centre north of Bangkok. She visits three times per week and conducts Bible studies as well as teaching them basic life skills. As at December 2014 more than 80 young people had become Christians and 40 have been baptised. These young people are often only in the Detention Centre for a short period of time (1-3 months) after which they return to the community. Because of the lives that they led prior to entering the Centre they are often at a loss for where to stay or what to do. Chuenjit visits these young people and continues to help them after they come out of the Detention Centre, generally for between 3 months to a year. She assists them to develop life skills and supports them as they reintegrate into study or work. Her vision is to help them develop good habits, learn new skills and have a more normal life. She is also very excited to see these young people grow spiritually. Along with the Thai young people there are also young people from Laos, Cambodia and Hmong hill tribe who have got on the wrong side of the law. Chuenjit teaches Bible studies in the Youth Detention Centre, and is training local believers how to reach out to the young people in the Detention Centres in other provinces. 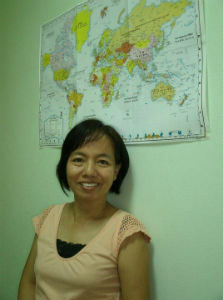 Her vision is to see Bible Studies and fellowship groups begin in every province in Thailand. BHW has had a long association with Lorraine Dierck and the Good News Team, partnering with them since 2001. In 2009 Lorraine presented an opportunity to us to help support three of their church planters, one of whom was Chuenjit (THA01e). In 2010 Chuenjit shared with BHW's Field Director her desire to not only spend time with these young people while they are in the Detention Centre, but also to continue to help them once they come out. Her church leadership and some close friends had been praying with her about this opportunity. In early 2011 BHW started funding this work. The numerous young people who will be reached by Chuenjit at the Detention Centre and then be assisted once they are released. Chuenjit has a real love for young people and as a single woman has dedicated her life to helping these 'high-risk' youth. God has really challenged her about reaching the unreached and as Thailand is such an unreached nation it is exciting to be able to partner with somebody like her. Chuenjit is a single lady who was on the staff at Muangtong Church where she had worked for 10 years. Prior to that she worked in another church on the pastoral team for 21 years. Chuenjit is a regular speaker at several churches in the area. To show God's love to the young people in the Detention Centre in Bangkok, and to assist them to rehabilitate back into society. To see these young people grow spiritually and develop good habits. The annual budget for Chuenjit's personal support including some extra funds to enable her to provide emergency care for the young people as required, is US$7,920.